I can’t wait for tomorrow. I can’t wait because the Jalada Language anthology will be live for all of us to read. As a publisher who has so many questions about writing in our local languages, this anthology means everything! 1. Edwidge Dro and Richard Ali on language, writing in Lingala and closing the gap between Francophone and Anglophone world via literature. 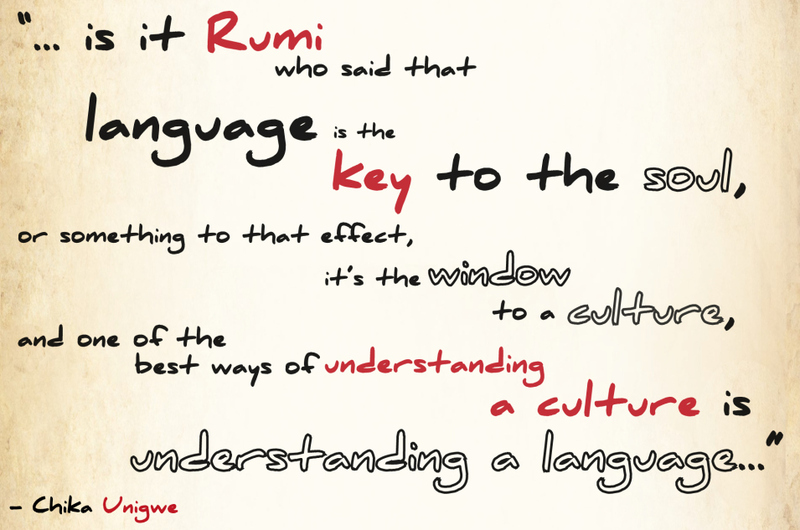 …That’s why I said that we Francophone had reached a stage where that debate has become redundant. I think we are now at the stage of the conscience of any African writer: It is up to the African writer to pick up his pen and write in his language. I treat language as both a palette and also a container. And I think there’s this subversive self that wants to know, what would Luo sound like if it was English? So, there is that. One of the examples I always use because I think it’s so fascinating is the Igbo word, Ndo. And usually when Ndo is translated into English, it is translated as sorry. But Ndo is not sorry; so if I stub my toe or my mother-in-law stubs her toe and I tell her sorry, she tells me, oh, but it’s not your fault (laughter), because sorry has a certain implication of wrong, as if you’ve done something wrong. But if my mother were to stub her toe and I tell her, Ndo, she understands, because what Ndo has that sorry doesn’t have, is a certain level of empathy that sorry doesn’t have. Because Ndo says I feel for you and I feel with you, which is a very cultural concept, it’s a concept of we are all one, whatever hurts you hurts me too, which is absent in the Western world. ‘Kagayi and friends’ present WHO BROKE THE EMPEROR’S TESTICLES?! Ft. Ibrahim Balunywa, Norah Namara, Slim Emcee UG the Poet, Rashida Namulondo, Jungle de Maneater, Daniel Nuwamanya, Hawa Kimbugwe, Q-ureas, David Kangye, Raymond Mujuni, Derrick Rushongoza, Ejuku Marcus, Alex Kakuru, Peter Kagayi Peter and other undisclosed performers. Come celebrate the memory of Uganda’s self-rule with poetry and a bonfire at the Uganda Museum on the night of Independence Day on Friday October 9 2015 at 7:30pm. Tickets will go on sale on September 30, but you can book now. For ticket-booking and ticket orders please call/whatsapp 0706-928-145. 5. 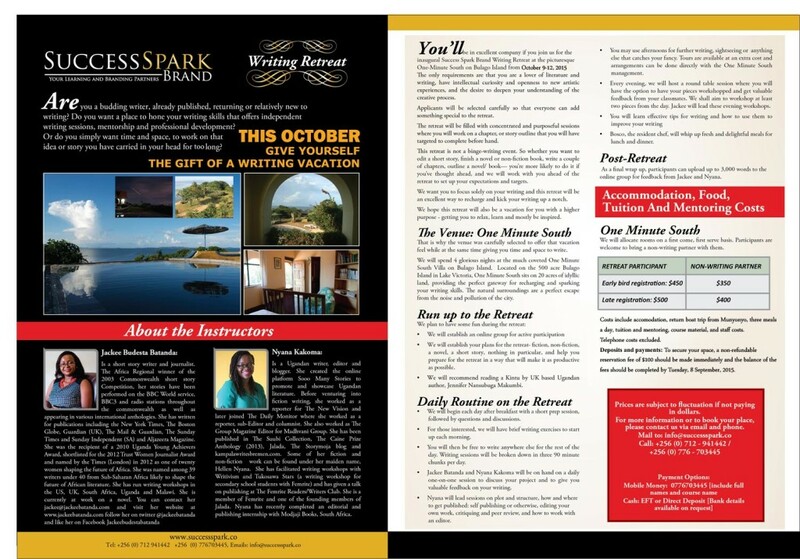 You’ll be in excellent company if you join us for the inaugural Success Spark Brand Writing Retreat at the picturesque One-Minute South on Bulago Island from Friday 9 October toMonday 12 October 2015. The only requirements are that you are a lover of literature and writing, have intellectual curiosity and openness to new artistic experiences, and the desire to deepen your understanding of the creative process. I could explore in detail how I watched the dog, how I kept the child away from him. Kept him away from the child. How it started with the dog chewing her toys, shredding her clothes, her baby-gros, her blankets, her tiny little jerseys, her booties. I could fill in some of the back-story of how he nipped almost everyone who visited us, perhaps even everyone. I should tell you that I tried to make out that it was just a nip, no big deal. People were afraid of him, afraid of visiting us. I could tell you how in the years that we had the dog, we had few visitors, few friends in our home. And in the same breath I could write of how much the dog loved me, how devoted he was, how he liked nothing better than to be right next to me, almost touching me, and how reassuring I found this. 7/7 is Sooo Many Stories’ way of helping you beat the Monday blues. 7 things that are making me happy in the literary world.